As the sun continues to set on Kobe’s reign over the NBA as the best player in the league, it might be finally time to crown a new king. Of course that title was prematurely given to LeBron James before he played his first NBA game after being drafted in 2003, but he could put some credibility to that claim by winning his first ring. History has shown that true dominance requires multiple rings, as we have seen the changing of the guard go from Magic/Bird to Michael Jordan to Kobe Bryant. Some could say that I fail to recognize Shaq and Tim Duncan, but let’s be real -- it is just as much about dominance on the court as it is marketability, and big men can’t sell shoes. Now we have the two biggest names outside of Kobe Bryant both fighting for their first championship. LeBron announced his new contract on national television while Durant simply tweeted about it. LeBron decided to take his talent to a big market while Durant decided to stay in the comfortable college atmosphere of Oklahoma City. 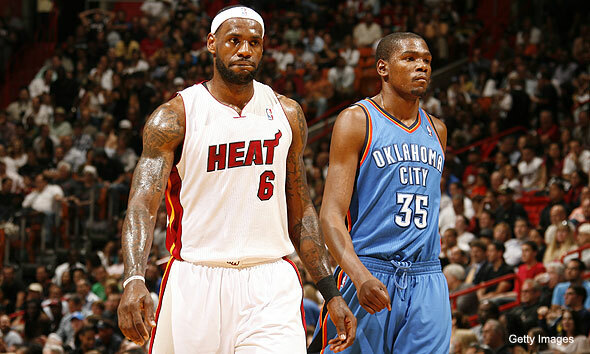 LeBron’s game has more force and power behind it while Durant's style has more finesse. I'll admit it. I dislike LeBron James. Always have and always will. The fact is I am a firm believer that one needs to earn his worth, and LeBron James accepting the nickname King James just always rubbed me the wrong way. I won’t deny his amazing talent or the fact that he deserved all three of his MVPs. I will even go as far to say that he was robbed by Derrick Rose a year ago. Yet his cockiness and narcissistic attitude continues to alienate myself and other NBA fans everywhere. Maybe he’s no different than Michael Jordan or Kobe Bryant in that regard, except for the fact that he possessed his sense of entitlement before winning a single ring. On the other hand, I am just another fan boy when it comes to Kevin Durant. As a graduate from the University of Texas, it is only natural for me to be a little biased on this subject. After watching Durant’s first preseason game live at the University of Texas, I thought he was just another overhyped high school star that shot a little too much. I am glad to say I was completely wrong in that early perception. Durant has become the anti-LeBron, and many hope that it’s #35 who dominates the next decade of NBA basketball. The era of LeBron’s dominance may never happen with the emergence of Kevin Durant. Durant doesn’t pass or rebound as well as LeBron, yet he seems to receive less criticism. Where Durant excels is his ability to not draw attention to himself and let his game build his fan base and brand. For the most part, both stars are perfect role models for children everywhere, yet that hasn’t really mattered to NBA fans over the years. In the end, the only thing that matters is the hardware, and this is certain: one of these stars will have a ring next fall. Time will tell whether LeBron James or Kevin Durant is truly worthy of taking the crown left by Kobe. Show me cockiness or narcissism from LeBron in the past year. "I'm an easy target," he told reporters Wednesday. "If someone wants to get a point across -- just throw LeBron's name in there. You could be watching cartoons with your kids, and you don't like it, you say, 'Blame it on LeBron.' If you go to the grocery store and they don't have the milk that you like, you just say, 'It's LeBron's fault.' "
Maybe not the normal form of narcissism, but clearly he always thinks everything has to do with him, and although he has made improvements first impressions are still hard to change. Being the biggest Lebron fan I know, I admit that this series (his third Finals appearance) is make or break for his unwritten legacy. Caleb - is that not true? Who out of the current generation of athletes has been more scrutinized than Lebron? According to 2011 Nba n-score Tim Duncan was the 5th most marketable athlete even though the Spurs were ousted in the first round. Kevin Durant didn't even make the list. Shaq has been one of the most marketable athletes in sports: tv, movies, music, broadcasting, own shoe line, etc. I agree Lebron is the most scrutinized, but at least part of that is brought on by his words and actions. Also a Big man might drive people to watch the games, but I am sorry find me 5 people you know that bought shaq shoes... also there is a reason why Nike throws money at players like Kobe, Lebron, Durant, Wade, and Anthony. The fan has a hard time relating to style of play of big men, instead we all still just want to be like mike. At the same time Adidas has used Dwight and Garnett as two of their biggest ambassadors for the past 4 years. To say that marketability is only selling shoes or playing style is gross oversimplification. As stated above, Shaq has been one of the most marketable athletes when he was at the top of his game (btw I used to own a pair of Reebok Shaq attacks). To your original article, though I understand why this discussion is the dominant discussion in basketball but it also leads people to forget that basketball is a team sport. For the Thunder to win, Durant will need just as much contribution from Westbrook, Harden, Ibaka, and Perkins as much as Lebron will need help from Wade, Bosh, and their inconsistent shooters. What if Durant or Lebron play 'poorly' and their teams will win, would we still be crowning them king of the league? I rewatched More Than A Game last night, and I have to say, I'm rooting for LeBron in this one. Rooting for him last year was more of rooting against the Mavs. But this year, I genuinely want him to win. Though, part of it is because I hear LeBron has a new movie coming out, and they aren't going to release it yet until LeBron regains a higher public opinion rating. However, in August, KD's new movie is coming out whether he wins or loses. Phil- I am not saying big men are not marketable, but in the last 12 seasons, only twice was the top selling Jersey that of a big man (once KG and once Shaq both years they were traded to a new big market). Kobe topped the list 6 times, Lebron twice, Wade, and Rose once. But I agree KD, isn't as popular as maybe a Dwight Howard, but give it time, not many people see OKC games, but with the Olympics and this finals i think that will changes. And yes even if they play poorly they will get credit, and even if they play well and lose they will get blamed. Its the life of a star, I don't agree with it, but that's how the media will spin it. I love you, Peter Wang. I'm going to watch More Than a Game before each Finals game this week.